The preferred way to use the Boulder Arts Commission identity stamp is over a white/light background. 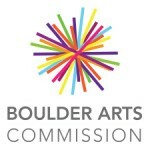 If the identity stamp must be placed on a dark background, or color options are limited, then the Boulder Arts Commission identity stamp can be knocked out and used on an approved brand color. Please observe the clear space around the identity stamp to maximize visual effectiveness. Nothing should intrude into this specified clear space. To download file: Right click on the link below. Choose Save link/target as. Then follow the information in the dialog box. Questions? Please direct your inquires to Lauren Click at clickl@boulderlibrary.org or 720-564-2355.